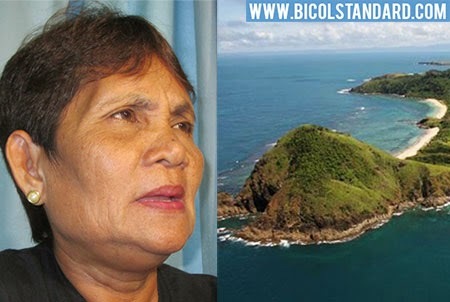 CARAMOAN—Punong Barangay Mercy Sueno of Barangay Gata in this town now desperately seeks the help of Malacañang in resolving the gruesome massacre of four gold panners in the quiet island of Lahuy last Saturday. Bullets were pumped into the eyes, head, and chest of the panners at around 9 PM while they were having their dinner. Eyewitnesses point to armed members of Task Force Sagip Kalikasan of the Provincial Government of Camarines Sur as the perpetrators. Tear-streaked and trembling, Sueno said in an interview by BICOL STANDARD that the Palace may be their only hope to find justice, as the persons who are involved in the crime are identified as henchmen of the provincial government. “I appeal to President Aquino and DILG Secretary Mar Roxas to bring to justice those who are responsible for disrupting the peace in my barangay,” Sueno pleaded. “It’s not even politics,” said Sueno. “The real issue here is greed. Task Force Sagip Kalikasan, which frequently uses the name of former governor LRay Villafuerte to put pressure on the locals, wants to control the mining operation in my barangay,” she explained. “TF Sagip Kalikasan had been forcing us to sell the gold to Gege Raygon, the only buyer of gold authorized by LRay Villafuerte. In fact, for several times, Tria and Mabulo told us that we can continue with our mining operation, as long as we sell all of our gold to Raygon, as per instruction by LRay Villafuerte,” she narrated. Raygon was the supported candidate of LRay Villafuerte for punong barangay during the last election. She lost to Sueno. Meanwhile, Francisco “Iko” R. Tria III is the district supervisor of TF Sagip Kalikasan in the fourth district of Camarines Sur. Tria was the candidate of LRay Villafuerte for mayor of the town of Sagñay. He lost to incumbent mayor Evelyn Fuentebella. Fermin Mabulo, for his part, is the administrator of TF Kalikasan, a former mayor of San Fernando, and a former provincial administrator of Camarines Sur. Last election, he lost his mayoralty bid in San Fernando town against incumbent mayor Eugenio Lagasca, Jr.
Sueno said that the locals have repeatedly refused to sell the gold to TF Kalikasan’s anointed buyer. “The problem is, her buying price, which is P900 per ounce, is significantly lower than the prevailing P1,200 per ounce that other buyers would offer. In Naga City, the price for an ounce of gold is P1,600,” she explained.